Card of the Day ~ Call on Archangel Raphael for Help~ The healing angel wants to help you, yet they can’t violate your free will. 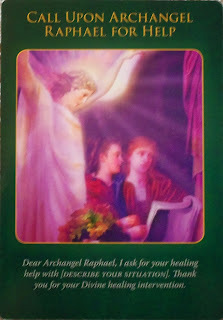 So this card is a reminder to ask for Archangel Raphael’s healing help for everything that you need assistance with. Raphael is an unlimited being whose sole purpose is to bring God’s will of peace through physical and emotional health. So it’s his pleasure and purpose to help you with your healing concerns. However, you must ask before he can help you. So Ask! ~Prayer: Dear Archangel Raphael, I ask for your healing help with [Describe your situation]. Thank you for your Divine healing intervention. Archangel Raphael answers all our prayers even though it may seem like he has not at times. Let ego go and just ask for help so everything can be taken care of and you don’t have to deal with this weight on your shoulders alone. May you have a glorious day my friends. I love you all!